The author boating on the Aegean Sea. 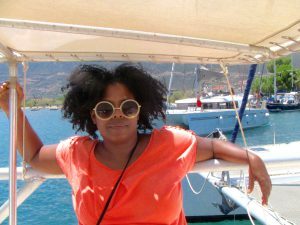 It came up at the last minute: A career coach’s newsletter had a paragraph in it about her upcoming trip to Agistri, Greece, off the coast of Athens. She would be leading morning and evening meditation, while her colleague, a woman from England, would coach the writing sessions. If I shared a room and took the option of writing without going to her classes, I could score the least expensive package. 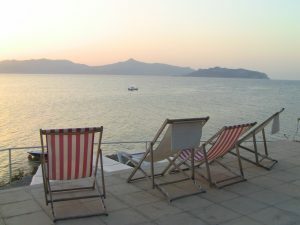 I booked a flight, wired funds to the UK, and within a couple of days I was packing my bags for my week in Greece, June 25-July 2. Click here to see my Greece 2016 slideshow set to music. As I quickly discovered, it’s challenging to get a lot of writing done through a jet-lagged haze. And though I cranked out about 11,000 words, what was more valuable was time to step back and consider the outline of my historical novel: What had I written, and what did I still need to write? Being at such a distance seemed to offer me a better perspective somehow. 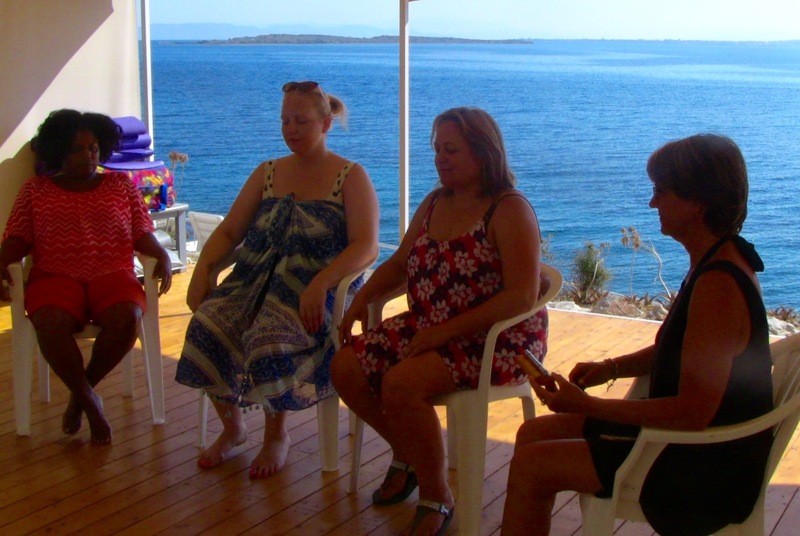 At the same time I realized that maybe the reason I was in Greece was not just to focus solely on the writing, but to enjoy the conversations with my fellow travelers, revel in the fresh delicious food, and side trips to another Greek island and snorkeling around a sunken city. What I also realized is that time away from the everyday is so important to my creative process. I came back feeling recharged, reinvigorated, and more connected to what I wanted to say.